Heida Q.S. Shoemaker Art Conservation specializes in the repair and preservation of art on paper and photographs. 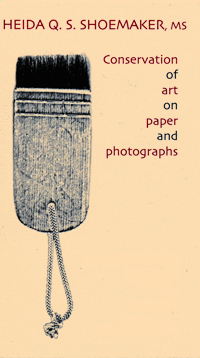 Art on paper includes prints, drawings, watercolors or acrylic on paper, pastels, documents, and maps. Treatment of photographs includes vintage silver gelatin prints, albumen prints, contemporary silver gelatin prints, color photography, digital prints, negatives, animation cels, cased photographs, and photograph albums. Treatment options cover a broad spectrum, from small repairs to the treatment of severely damaged and deteriorated objects. Analysis and documentation accompany all completed conservation treatments. Consultation services include guidelines and examples for archival framing, storage, and shipping, as well as preventive maintenance. published on the Rochester Institute of Technology Image Permanence Institute website. published on the American Institute for Conservation website.